After abandoning competitive running back in high school, Kakeru Kurahara has no desire to return to the sport during his college years. But when an impromptu shoplifting-related sprint brings his talent to the attention of Haiji Kiyose, he soon finds himself wrapped up in an adventure he never imagined. Haiji is determined to run in the Hakoden, a ten part relay race that spans to the top of Mount Hakone and back again. To achieve this goal, he plans on convincing Kakeru and his eight other dormmates to dedicate themselves truly incredible, and seek glory with the most unlikely team imaginable. Running is not the sort of sport you'd think would easily lend itself to anime drama. It's a largely solitary affair, and there's not really any way to directly, tactically engage with your opponents. It's also fairly repetitive, and more about managing your overall tank of energy than overcoming a diverse series of obstacles. And even if you win, it's difficult to convey a clear sense of having “overcome” some specific challenge, or defeated a clear adversary. And yet, in spite of all these obvious hurdles, I'd emphatically say that the running-focused Run with the Wind is one of the best sports anime I've seen in many years. A great deal of the show's strength comes from its direct engagement with that idea that running is a solitary venture. The show focuses principally on two young college students - Kakeru, a freshman who's sworn off competitive running, and Haiji, a senior determined to achieve running glory. His chosen goal is Hakoden - a grueling ten-part college relay that demands a talented and dedicated team. Haiji doesn't have a talented and dedicated team; he has his nine random dormmates, whose numbers include a cynical young law student, a manga enthusiast with no athletic ability whatsoever, and a habitual smoker. But across the course of Run with the Wind 's thrilling episodes, he manages to turn this ragtag bunch into a group of champions. Much of Run with the Wind 's early episodes are dedicated purely to inspiring Haiji's various teammates to genuinely commit to the Hakoden. These episodes demonstrate that beyond conveying the experience of running itself, this production is equally adept at conveying more mundane, universal college experiences. The dorm these contenders share feels like an utterly lived-in place, full of colorful background details and livened by constant incidental conversations. Run with the Wind builds up the bonds between its stars through both idle conversations at the dorm and dedicated character arcs, possessing the appeal of both a grounded slice of life and a focused character drama. Because the show's first act is so fully dedicated to selling both these ten individual runners and their communal relationships, everything that follows is able to take advantage of that bedrock of humanization and emotional investment. The road to Hakoden seems wildly improbable at first, but as episodes pass, it becomes clear just how much each of these characters are getting out of their training, and how much they owe to each other. Over time, the show's underlying insistence that the true nature of running is teamwork becomes viscerally clear, illustrated through the long and sympathetic paths of all of its stars. The show also makes terrific use of the Hakoden itself, as a way of lending dramatic solidity and meaningful stakes to a theoretically nebulous conflict. In order to qualify for the Hakoden, Haiji's teammates must each beat a certain time threshold, and also collectively succeed at a major qualifying event. These hurdles give the show a clear and propulsive dramatic structure, with the relative distance to Hakoden and each characters' individual struggles always feeling clear and consequential. And once qualifications are done, the course itself becomes one more tactical feast, as the distribution of teammates and each of their individual trials offer more compelling drama to sink into. Run with the Wind 's terrific characterization and clever distillation of running into a tactical drama still wouldn't mean much, though, if the show couldn't visually execute on these ideas. Fortunately, Run with the Wind is as much of an aesthetic marvel as it is a narrative one. Produced by the same Production I.G subteam that created Haikyu!! and Welcome to the Ballroom , Run with the Wind boasts beautiful color work, inviting backgrounds, and sumptuous character animation. The concept of individually animating all the runners at a given track meet is a nearly impossible feat, but Run with the Wind does an admirable job of not just successfully animating these marvels, but also instilling all of its runners with unique body language and running gaits both on and off the course. That said, my biggest complaints with this show are also related to its visuals. First off, though the show does an incredible job of animating what portions of running it can, it's still forced to rely on CG models for the larger crowd scenes. This is basically a necessary concession, but it's still a visual hiccup that detracts from the overall look. Additionally, the routes our stars use to practice on have a tendency to look a little similar, and the grass embankment they generally collapse on is both visually unappealing, and also often seems entirely separate from the characters theoretically lying on top of it. Those issues are relatively minor, though, and the show has plenty of other strengths to spare. Yuki Hayashi 's soundtrack deserves particular notice - his distinctive melodies and diverse instrumentation give Run with the Wind a clear and compelling aural identity, consistently elevating the show's best moments. And the show comes together superbly, with the whole last act working as both a thrilling sports drama and a resounding validation of the bonds between its cast. 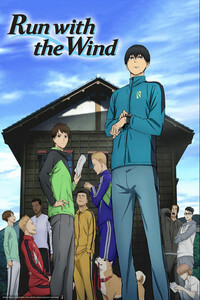 On the whole, if you have any love for sports anime, I urge you to give Run with the Wind a shot. Sports dramas this good are a rare and beautiful thing.